Two exoplanets, Kepler 186f and Kepler 62f are much like Earth after analyzing their spin axis dynamics. These dynamics contributes to seasons and climate. 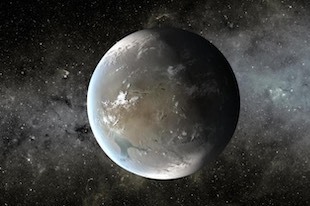 Both exoplanets are different from Mars and the Earth because they have a weaker connection with their sibling planets but their spin axis have remained constant over millions of years. Rocks and deep sediments are home to 70% of the Earth’s microbes. These microbes represent 15 to 23 billion tonnes, 245 to 385 times more than the mass of the 7 billion humans. Thus, since August 6, 2017, we are in 73 aH, (meanning 73 after Hiroshima).